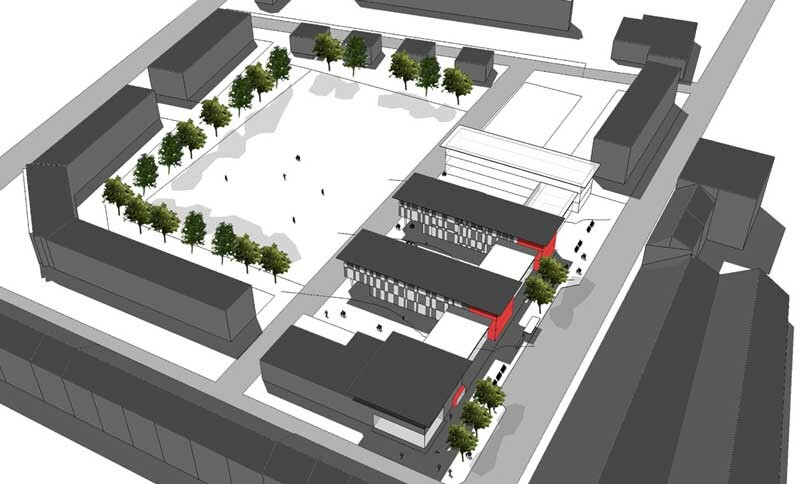 Anderson Bell Christie – a Glasgow based architectural practice – has beaten off stiff competition to design three new primary schools for Glasgow City Council. 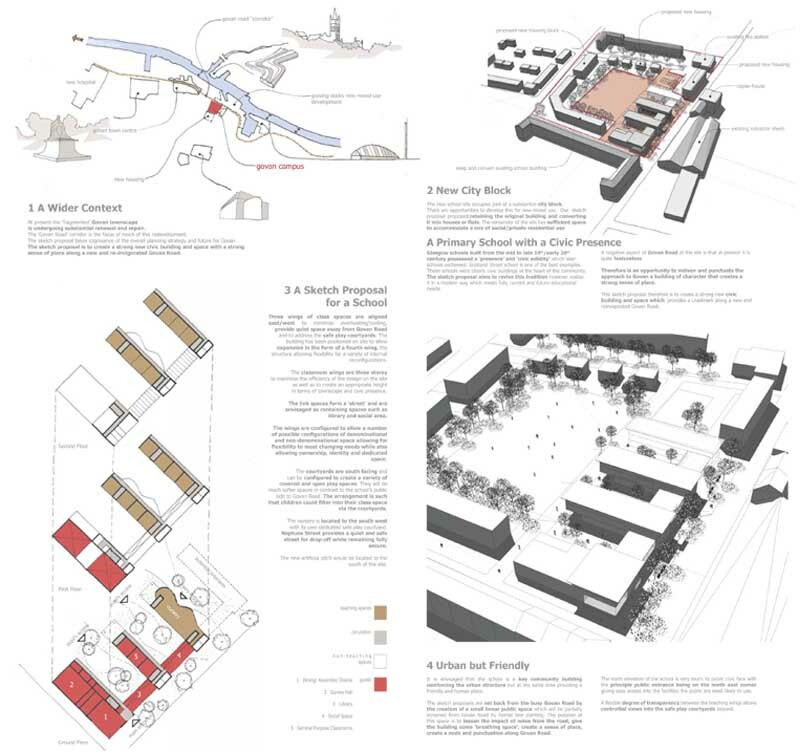 Their designs take account of the special and different character of each of the three chosen sites and aim to re-establish the school as an important building for the community. Glasgow based Anderson Bell Christie architects (recently runners up in the Education, Private and Public Housing and Masterplanning categories of the BD Architect of the Year Awards have won the commission to design three new Primary Schools for Glasgow City Council in three very diverse city neighbourhoods: Ruchill an ‘new neighbourhood’ in the north of the City; Tinto a new school in a primarily suburban, residential area and Govan where significant social change is anticipated as a result of City Council and Partner investment, including the re-location of the BBC Scotland Headquarters. 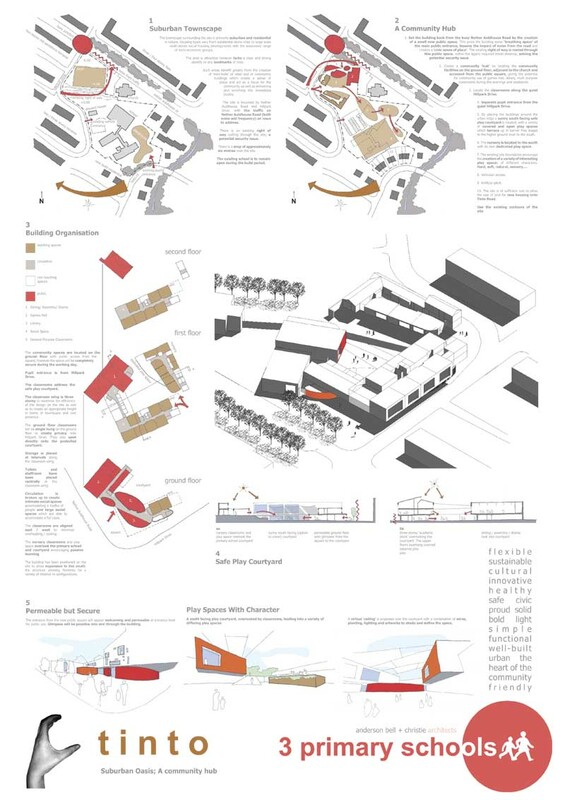 The proposed designs, which were chosen in part by future building users, focus on re-establishing the school as an important building in the community and take into account the special and different characteristics of each of the three chosen sites. “From the start we were keen to design buildings which were appropriate to Glasgow as well as contributing to the regeneration and development of the three diverse communities involved. Our sketch designs draw on the civic presence and social importance of some of Glasgow’s turn of the century schools – but our designs will be developed in the context of delivering the needs of education and for sustainability in the 21st Century. Our interest in urban typology and our ‘on the ground’ regeneration experience has informed our work in some of the more disadvantaged areas in the central belt of Scotland. Often the results of poverty and social change have undermined the original, comprehensible urban structure leaving behind an eroded built environment that presents a real design challenge. In this situation, good planning and design can work in tandem with community involvement to bring about positive changes-thus adding real value to communities. We believe that if buildings and the environment are understandable then an individual’s sense of well being and security really is increased- it’s absolutely critical to get it right. We always aim to look outside the narrowest ‘architectural’ interpretation of our role. We try to be innovative in our response to every issue and to use our expertise to take a fresh look at proposals from different points of view. ; for example we have a strong interest in sustainability in its widest sense, in the policies and programmes which aim to give practical help to those who need it. We recognize that architects are uniquely able to shape the ‘character’ of an area and therefore contribute to its success or failure – we are committed to the design of places which present a feeling of their ‘own identity’. We see the investment in a new primary school in each of these areas as a positive opportunity to consolidate and take forward an existing community into the next generation”. At present Govan’s urban fabric is undergoing substantial renewal and repair, and the ‘Govan Road’ corridor is the focus of much of this redevelopment. 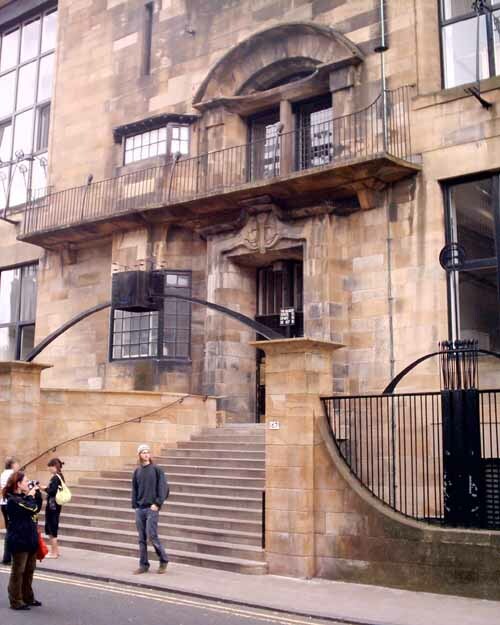 Glasgow schools built from the mid to late 19th/early 20th century were clearly civic buildings at the heart of the community – our design aims to revive this tradition. 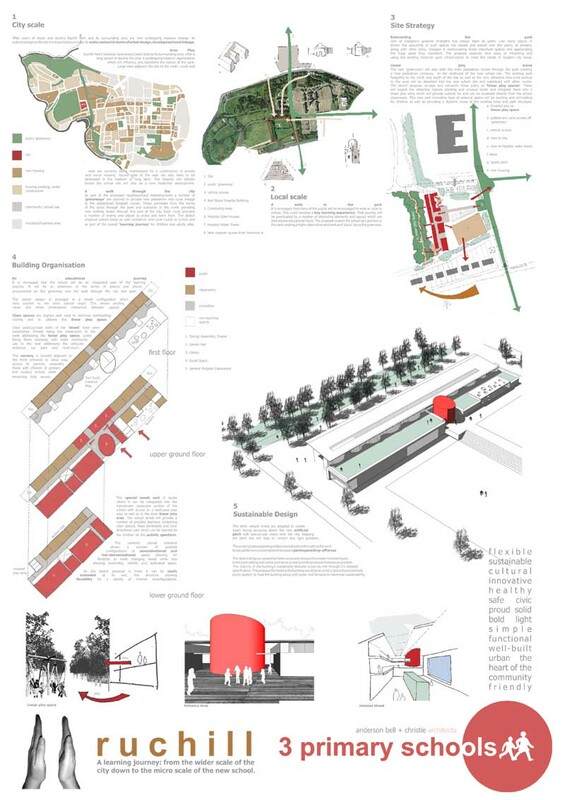 Ruchill Primary – reinventing the park; a learning journey from the wider scale of the city down to the scale of the new school. One of Glasgow’s greatest legacies is its public parks. As elsewhere the popularity of these has waned over the years; but at present, along with other cities, Glasgow is rediscovering and aiming to revitalize these assets. Our design for a school in the park is part of this process and represents a real opportunity to create a stimulating learning environment. The area surrounding this site is primarily suburban residential and lacks a clear and strong identity or any built landmarks. 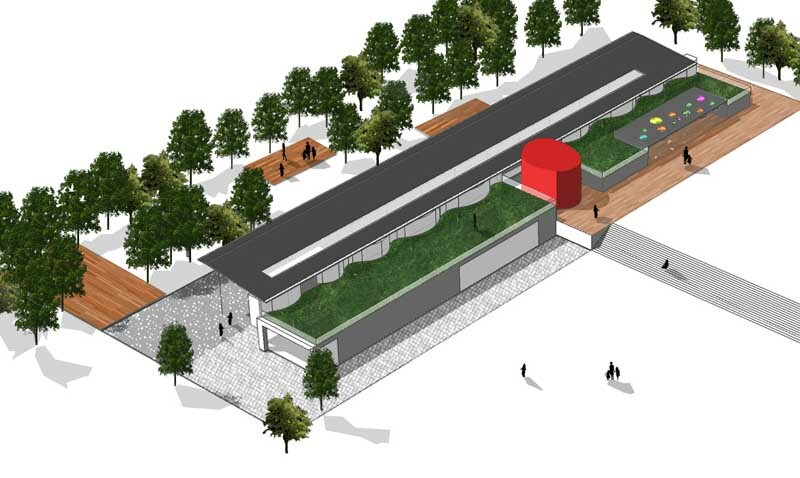 Our design for the new school will act as a ‘mini-hub’ creating a focus for the community as well as enlivening and enriching the immediate locale. Anderson Bell Christie is an energetic design-driven practice. We combine commitment and enthusiasm, with professionalism and a pragmatic approach. Our strengths were recognized by the Architecture Foundation in 1998 when the practice was chosen as one of the UK’s ‘New Architects’ and since, by the BD Architect of the Year shortlists, where we were runners up in four categories. The practice’s client base is wide and includes public sector organisations, housing associations, charities and community groups, as well as commercial clients and developers. Anderson Bell Christie have worked on residential, health, educational and commercial projects, and more recently are working on masterplanning and urban design projects. £27 million investment in new primary schools for Glasgow. Anderson Bell Christie are to design Glasgow’s three primary schools at Govan, Ruchill and Tinto, with a total cost of £27 million. The Council were keen to promote the highest quality design and Anderson Bell Christie were selected from a shortlist that included; jm architects, Building Design Partnership, RMJM (Glasgow), HLM and John Pardey Architects (with Professor Sir Colin Stansfield Smith). All of the shortlisted architects were invited to submit their design proposals for scrutiny by future building users as part of the tender process, and Anderson Bell Christie’s proposals were selected. 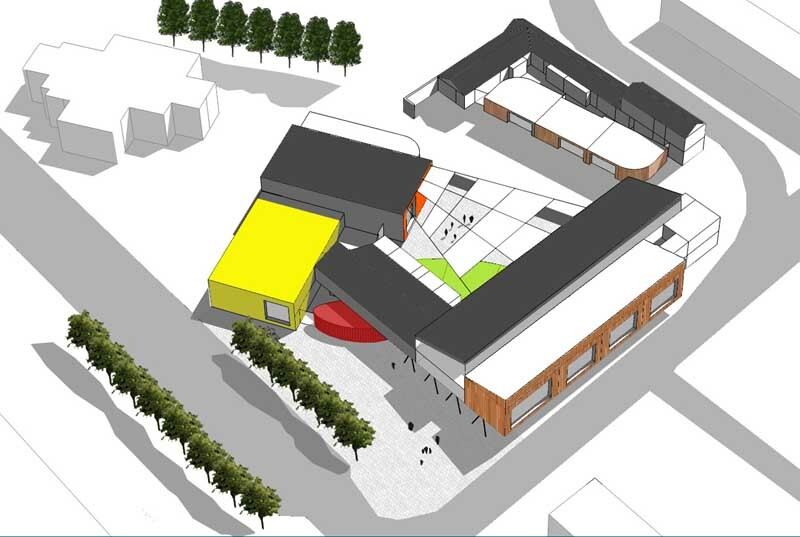 Anderson Bell Christie to design three primary schools at Govan, Ruchill & Tinto.